The Ultimate Public Speaking Companion! 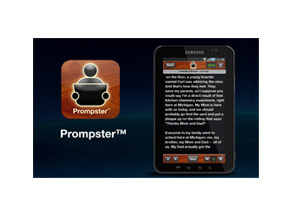 Prompster™ is the ultimate teleprompter for Android phones and the Galaxy Tablet. It smoothly scrolls easily readable text for audible presentation. Eliminate cue cards, flash cards, notes and scripts forever. It is the ideal app for practicing and delivering public speeches, lectures, podcasts, radio scripts, video scripts, and for any scenario that requires a speaker to communicate with an audience using notes or a script. With Prompster™, public speaking is made easy!